Colorado needs to consider raising the base contribution rates paid by businesses to the state’s unemployment insurance trust fund (UITF) in order to avoid the same insolvency problems in the future that the fund is experiencing now, according to an audit presented Monday to a legislative committee. Legislators and business groups both warned that the state has to move slowly and deliberately on any changes it may make, for fear of further hurting businesses that already have been pummelled by the economic downturn. Don Mares, executive director of the Colorado Department of Labor and Employment, said he will sit down with business leaders and advocates for the unemployed before suggesting any major changes to the fund. 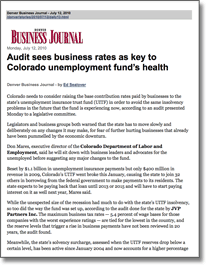 Beset by $1.1 billion in unemployment insurance payments but only $400 million in revenue in 2009, Colorado’s UITF went broke this January, causing the state to join 32 others in borrowing from the federal government to make payments to its residents. The state expects to be paying back that loan until 2013 or 2015 and will have to start paying interest on it as well next year, Mares said. While the unexpected size of the recession had much to do with the state’s UITF insolvency, so too did the way the fund was set up, according to the audit done for the state by JVP Partners Inc. The maximum business tax rates  5.4 percent of wage bases for those companies with the worst experience ratings  are tied for the lowest in the country, and the reserve levels that trigger a rise in business payments have not been reviewed in 20 years, the audit found. Meanwhile, the state’s solvency surcharge, assessed when the UITF reserves drop below a certain level, has been active since January 2004 and now accounts for a higher percentage of the trust fund’s revenue than the base charges do. State officials don’t expect that charge to be deactivated for at least five years. All of this, Mares suggested, means that the state should consider a holistic reworking of its unemployment charges, possibly raising the base rates while reducing the insolvency surcharge. Colorado might also consider raising the trigger that sets off a gradual hike in base rates when the fund’s reserves slip below a certain amount and reconsidering whether it’s appropriate that some businesses do not have to contribute any money to the UITF in good economic times, he said. Business-group officials who attended the Legislative Audit Committee meeting said that while they agree that something must be done to avoid having to borrow so much in federal funds during future downturns, they don’t want to see base rates rise so high that it stunts small-business hiring. The state, which determines businesses’ base rates for a calendar year on June 30 of the year before, should also consider waiting until later in the year to get a better handle on what the economy will do to UITF reserves, said Virginia Morrison Love, Colorado Competitive Council lobbyist. “For the benefit of the employers and the economy, we need to take a long, slow approach to build a bigger cushion,” Love said. Rep. Joe Miklosi, D-Denver, said he liked Mares’ suggestion to defer loan payments that will be due next year in order for the state to buy time and bring in more revenue as the economy approves. Rep. Frank McNulty, R-Highlands Ranch, added that he believes a consensus solution can be reached but only if there is buy-in from businesspeople. Â©2008 - , Insurance Forum Foundation. All Rights Reserved.